The Easter holiday period was one of our busiest in 6 years. We had 3 weddings and nearly full occupancy in between them. With all of this going, on the good old British weather decided to throw us our biggest challenge so far. We have had lots of snow, strong winds, heavy prolonged rain, thick fog etc. This time however we had the combination of heavy snow and very strong winds. I woke up at 4am and immediately though marquee! After what happened just before Christmas when the snow proved too much for the marquee, I was, needless to say a bit worried! As it happens the wind actually helped keep the roof clear of snow, but as I didn’t want to take any chances I stayed down there for a few hours. I had decided previously that in such circumstances I would leave the heater on to melt the snow off the roof, but again the elements conspired against me. The power went off just after 4am. Although the marquee heater runs on diesel it still need a power supply to work. The electricity company’s automated phone system said that the power could be off until lunchtime. We have a back up plan for sustained power cuts of borrowing a generator and connecting it to the communal dining room. That way any guests can stay warm and have access to cooking facilities. So off I went to get the generator. The local farmers do a superb job of keeping the local roads open when it snows, but this time the winds just kept putting it back and created huge snow drifts. Once I got past the tree lined section of road the visibility was nil and the snow was just too deep. I went home. I knew that the emergency lighting was going to stay on until sunrise, so I thought I would try again later. As people woke up I told them what the situation was. But the snow and wind remained, and the estimate for the power coming back on kept being pushed back. I dug out our camping gas set which I gave to one family who had a young baby and needed to be able to heat up milk, and we gave out lanterns and torches so when darkness fell we could still get around. The atmosphere was brilliant, everybody making the most of not being able to go out, no TV and electrical gadgets. The playing cards and board games all came out, and everyone just chilled out. Well we also made sure everyone had plenty of coal so they could be “chilled out”, rather than just cold! Getting hot food then became the priority. I managed to get hold of a gas cylinder which I could connect up to the a gas hob that we have, and everyone then took turns to cook . Meanwhile, we were the same in our house. Everything either is electric or needs electricity to work! 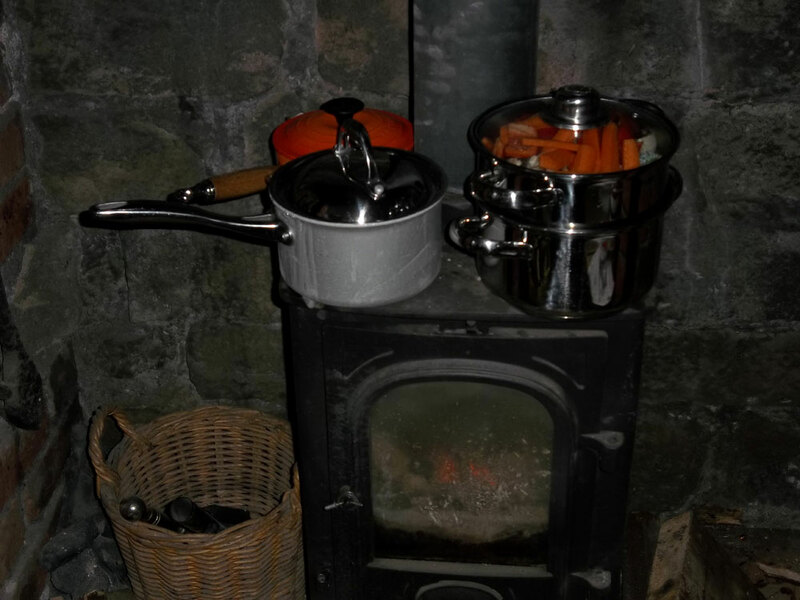 Julie tried boiling water on our little wood stove – it worked. 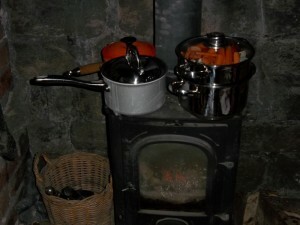 So we started off with hot drinks, and then with pans and steamers were able to cook a proper meal. It felt like pure luxury! As darkness fell, we decided to turn in early after an enforced day of relaxation. Just then the power came on for a tantalizing second or two and then went off again, fortunately it came back on and stayed on just in time to watch “the apprentice”. 2 weeks on, we still have small traces of the snow in the more hidden parts of the grounds but I don’t think it will last much longer.